SV Veterinary University M.V.Sc, M.Tech, Ph.D Courses Admissions: Sri Venkateshwara Veterinary University PGCET 2018 Notification, SVVU M.V.Sc/M.Tech Course Admissions, SVVU PG Entrance Test 2018 Notification, Admission into M.V.Sc/ M.Tech courses, svvu.edu.in M.V.Sc /M.Tech (Dairy Technology/Dairy Microbiology), Ph.D courses Admissions 2018. 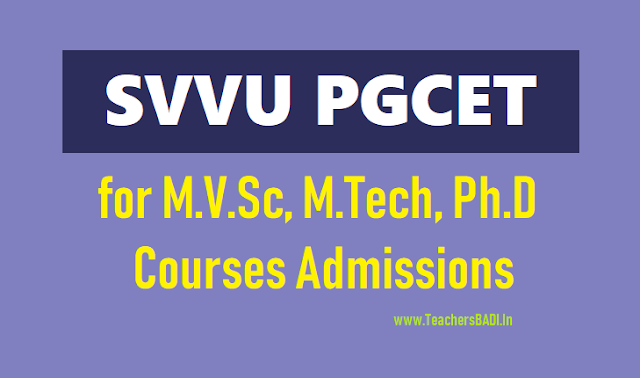 SVV University has given PG Entrance Test 2018 notification and applications are invited from the candidates belonging to Andhra Pradesh for 85% seats. The 15% of seats are open for candidates of both Andhra Pradesh and Telangana provided the latter appear for Entrance Test conducted by SVVU. However candidates from Telangana are not eligible for stipend. Sri Venkateswara Veterinary University, Tirupati invites applications for admission for M.V.Sc & Ph.D for the Academic year 2018-2019. M.V.Sc Field: Animal Genetics & Breeding, Animal Nutrition, Livestock Production Management, Livestock Products Technology, Poultry Science, Veterinary Anatomy, Veterinary & Animal Husbandry Extension Education, Veterinary Biochemistry, Veterinary Gynecology & Obstetrics, Veterinary Medicine, Veterinary Microbiology, Veterinary Parasitology, Veterinary Pathology, Veterinary Pharmacology & Toxicology, Veterinary Physiology, Veterinary Public Health & Epidemiology, Veterinary Surgery & Radiology. Veterinary Anatomy, Veterinary & Animal Husbandry Extension Education, Veterinary Biochemistry, Veterinary Gynaecology & Obstetrics, Veterinary Medicine, Veterinary Microbiology, Veterinary Parasitology, Veterinary Pathology, Veterinary Pharmacology & Toxicology, Veterinary Physiology, Veterinary Public Health and Epidemiology, Veterinary Surgery & Radiology. i) M.V.Sc/M.Tech (Dairy Technology/Dairy Microbiology): The selection of the candidates shall be based on the previous academic record (B.V.Sc & A.H /B.Tech (Dairy Technology) –30%, Intermediate (10+2) -10%, 10th Class-5% and achievements in extra curricular activities 5% and performance in Entrance test 50% ). The entrance test shall be comprehensive one, covering all relevant subjects prescribed for the concerned Bachelor degree requirements of this University as per VCI MSVE-2008/ICAR Regulations. The Entrance Examination paper contains only 200 multiple choice questions. The candidates have to mark answers by darkening circles on OMR sheet. The candidates getting 40% or more marks in entrance test only are eligible for admission. However, in case of SC/ST/PH candidates, there are no minimum qualifying marks and candidates are admitted to the extent of seats reserved for them. SC/ST/PH candidates claiming seats under general category have to obtain at least 40% marks in the entrance test. In case of NCC candidates B certificate holders are given 1 mark & C certificate holders are given 2 Marks. In case of C certificate holders benefit is given only for C certificate. The duly filled in application along with attested copies of required certificates, should reach to the Registrar, SVVU, Administrative Office Dr.Y.S.R.Bhavan, Tirupati on or before 10.12.2018 either in person or by Registered Post. Enclosures to the application: The candidates should submit copies of the following certificates along with the application. Documents enclosed to the application shall not be returned. Hence candidates are advised to enclose only copies of the following certificates. b) Memorandam of marks (all years) obtained at the qualifying ( B.VSc & A.H/B.Tech Dairy Technology level) examination or transcript, 10+2 (Intermediate) and 10th class examinations. c) Provisional/degree certificates of the qualifying examination. d) Study Certificates from the Heads of recognized Institutions or Residence Certificate or a certificate from the employer as the case may be (Vide Appendix). Those who have continuously studied in recognized educational institutions should enclose study certificates. Residence Certificates will not be accepted in such cases. Those who have a break in the year of study for reasons other than failure or those who passed the examination by private study should submit residence certificates in the prescribed proforma enclosed in annexure. e) Social Status Certificates issued by the competent authority in case of candidates belonging to BC/SC/ST. The admissions given under this quota shall be provisional till the genuineness of the social status claim of the candidate is certified by the respective Departments of the Government. f) Certificate towards achievements at B.V.Sc&AH/B.Tech (Dairy Technology) level in NCC/ NSS/Sports/Games/Cultural/Literary activities at International (Representing Nation)/National level (Representing State) Inter-University level, if applicable. g) Date of birth certificate or S.S.C certificate where date of birth is mentioned. i) Certificate showing the formula for conversion of OGPA/CGPA into marks in respect of candidates who passed their examination from universities other than S.V.Veterinary University and A.N.G.R Agricultural University.